To get encrypted files back after ransomware virus attack, you need to create a ransomware rescue disk. How Does Ransomware Encrypt Your Files? As we all know, once attacked by ransomware, your personal files will be hacked as hostage for ransom. Generally, there are two ways ransomware will take to hack your import data, by directly encrypting your files or by lock your computer screen. Both ways will result in your files not accessible to you. Yes, your files are still where they are but just can’t be accessed by you. Thus, you can find a way to get to your files and further decrypt them. Then, how to get to your files? You can create a ransomware rescue disc. How to Make a Ransomware Rescue Disk? As mentioned above, ransomware steal your files either by directly encrypting them or by locking up computer. No matter which way it make use of, you are most likely unable to boot into your local operating system and operate your computer. Hence, you need to create a ransomware rescue kit to first boot the failed machine up and then do further rescue to your files. To generate a ransomware rescue disk, you should first of all pick up a reliable ransomware rescue disc creator, download, install and launch it on a working computer. Also, insert an USB flash drive into the working computer for creating ransomware rescue disc. Then, start creating ransomware rescue kit with it. The following will take AOMEI Backupper Free (especially for ransomware) for instance. Step2. 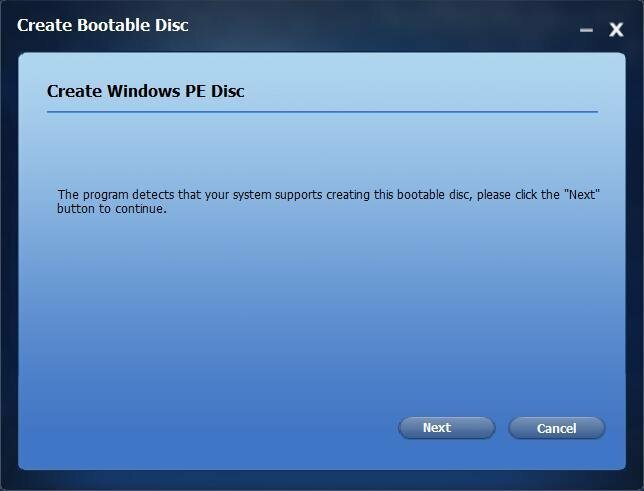 It will check out whether the current system valid to create ransomware rescue disk or not. If it is, the below screen is what it will present to you to go on; if it is not, just follow the easy guides to make the OS valid. Step3. Make ransomware rescue USB is recommend here for USB is convenient for being inserted to the affected computer for rescue data. Step4. Click “Next” and it will start progress. Wait for it finishes and pull out the USB drive. 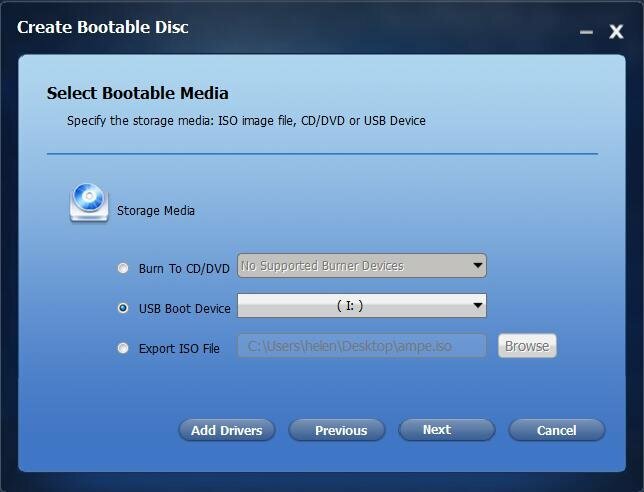 During creating the ransomware rescue USB, AOMEI Backupper put itself into the bootable device. So, when you insert the USB into the infected computer and boot from it. When it boots up, Backupper will pop up automatically for usage. Next, you can make use of its Backup features to backup your personal files out of the hostage machine. 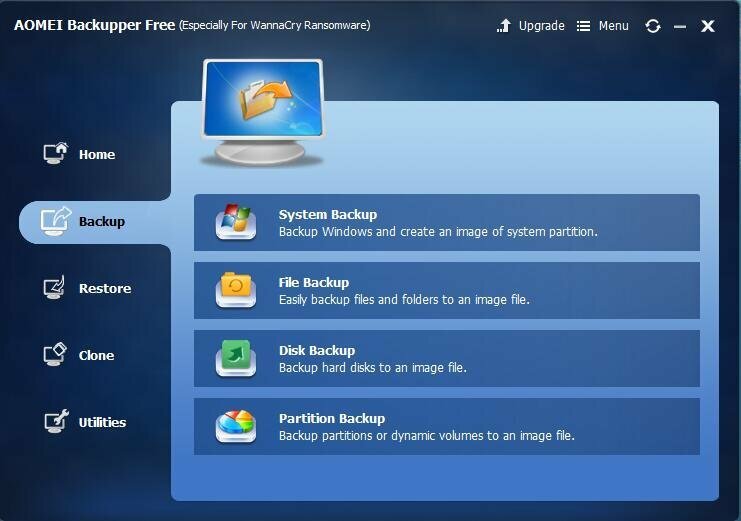 If the ransomware virus directly encrypts your files, backup the files out and restore them to another uninfected computer might make the files unencrypted immediately; If the ransomware stuck your files by lock computer screen, backup the files out and restore them to another uninfected computer probably make the files unencrypted immediately since the files has out of the control of the infected machine. 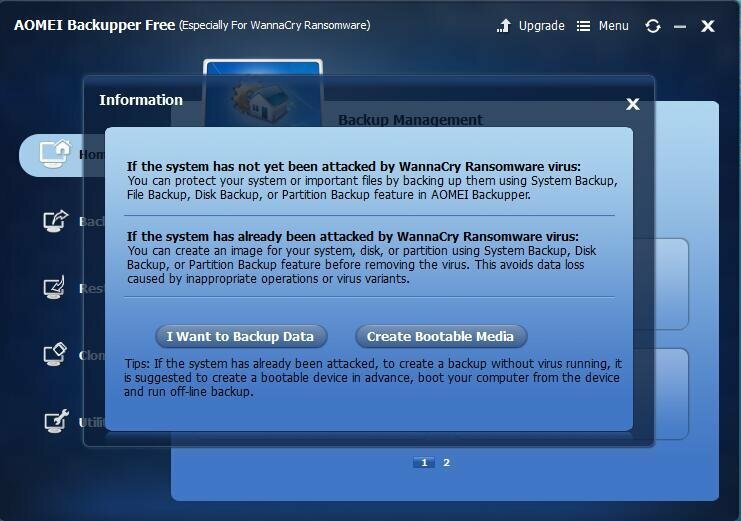 Create ransomware rescue disk to get encrypted files back is just a part of ransomware rescue plan. To mitigate the loss of ransomware attack to the minimum, there still have much to do.